John and Nancy Smith are widely recognized authorities on doorstops and figural cast iron, and have been avid collectors for over forty years. They are well known dealers specializing in Cast Iron, Folk Art, and Country Americana. Included in their collection of figural cast iron are doorstops, doorknockers, banks, bookends, and lawn sprinklers. They also collect early Americana, folk art, Czech pottery, early decoys, and carvings with an emphasis on folk artist Frank Finney. 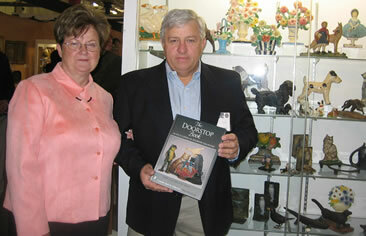 As dealers, under the name “American Sampler”, they have appeared at major antique shows since 1971. They have two grown children, Brooke and Todd, both of whom share their parents’ interest in antiques. John and Nancy, a former French and Spanish teacher, bred and trained thoroughbred racehorses on their Maryland farm until 1992. They love to spend their free time with their two Bedlington Terriers, wildlife watching, traveling, and working with turtle rescue and rehabilitation. John is currently the Founder and President of the Figural Cast Iron Collectors Club. John and Nancy have been members of the Still Bank Collectors Club of America since 1971, and have served on the club’s Board of Directors and Ethics Committees. They have written numerous articles on doorstops and figural cast iron for clubs, newspapers and magazines. In addition, they are the figural cast iron consultants for Morphy Auctions in Denver, Pennsylvania. They have both been instrumental in the formation of many major private figural cast iron collections throughout the United States, as well as consultants to numerous interior designers and decorators. John and Nancy are always interested in purchasing single items or collections.